It's still early, but in the distance I can hear the motor of the Rangers bandwagon slowly starting to churn. Tops in the NHL in points and tops in goals. A 4-2 win over the L.A. Kings enabled the Rangers to sweep their 3 game homestand and extend their winning streak to 6 games, their longest since 2005-2006. The official recap is here. 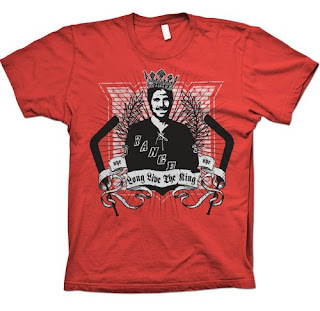 The equation is simple -- the Rangers' King Henrik is better than any other goalie. The team that pundits picked for the bottom half of the standings has caught the attention of the league. North of the border, TSN ranked the Blueshirts #1 in its weekly power ratings today. It's early but compare this season's start to last year's similar beginning and you get the sense that this team has more staying power. Meanwhile, there was a game to be played against the #4 team in the TSN rankings -- the L.A. Kings, riding their own 4 game winning streak. Tonight gave credence to my observation last week that it would be interesting to see how the team would look in its 3rd game in 4 nights (fortunately all at home). The answer: slower and ragged. The Rangers were a step behind nearly all night long. Passes were not crisp, the forecheck was often nonexistent, and timing was off. The Kings outshot the Rangers 36-21 and it seemed during the 2nd period that the Rangers were never at my end of the ice (i.e., the offensive zone) but were stuck playing defense for minutes at a time. The Kings dominated large portions of the game -- hitting, shots (they outshot the Rangers every period including 10-1 in the 3rd), and territory -- but in the most important area, the scoreboard, they failed and that was due to the goalies in net. The Rangers PK unit again did excellently by defending 6 out of 7 opportunities. Several times it appeared that the Rangers were aggressively trying to move the puck into the Kings' zone and in one of those instances, they failed to get back in time to prevent a score. But an 85% success rate is consistent with their efforts so far which is good for 6th in the NHL. The Kings started their backup Erik Ersberg and the Rangers went with Henrik Lundqvist. And upon the choice of goalies the game turned. The Kings had decided on this rotation since day one. Coach Tortorella's idea of playing Valiquette on Sunday against Anaheim and let Henrik play the next two with a day of rest in between turned out to be a brilliant ploy. The hero of the game for the Rangers was Henrik Lundqvist. He simply stoned the Kings time and time again. He was sharp, played angles well, saw the puck, was in the right place for numerous deflections and stood up to an onslaught of odd man rushes, players flitting across the goal mouth and numerous players joining him in the crease or the goal. The stop he made early on to thwart a 2-on-1 was jaw-dropping. He was confident and never was rattled even after the Kings took a page from the Leafs attack on Monday by making him a target of numerous runs. Finally, the Rangers came to his defense but there was a scary moment when Higgins collided with Henrik in the goal and Henrik did not rise all that quickly. 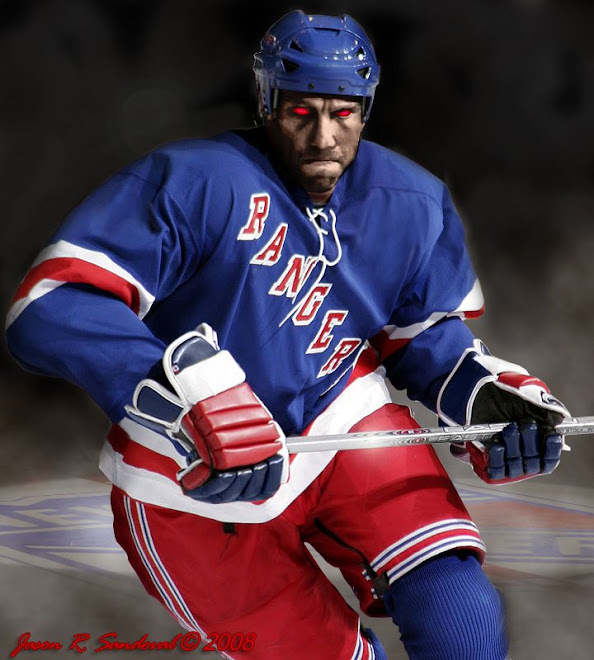 The Rangers, despite their scoring, will only go as far as Henrik can carry them and they need to protect him. Fortunately, one of those collisions led to a goaltender interference call that the Rangers converted into a goal. if they paid more attention to the goal crease while play was occurring. Vinny Prospal opened the scoring early in the game with a PPG by deflecting a Del Zotto shot (2 assists) from the point that was directly on net (how different is THAT from last year?). Last year's team would have been content to sit on the lead the rest of the game (think losing to Dallas 2-1 and Florida 2-1 at home) but that was then. The goal was Prospal's 200th. He was not finished. Later, after Ryan Smyth tied the score, the Rangers had a 5-on-3 advantage and Prospal did some serious battling at the goal mouth and shoved the puck under Erksberg for a 2-1 lead with 7 minutes left in the 1st. Finally, in the 3rd period, Prospal assisted on Gaborik's goal that cemented the game with 15:38 left. Prospal's 200th about to be deflected top-shelf, right side . . .
leading to a celebration in the corner. Boyle's goal (his first as a Ranger) was pretty much the only bright spot for the Blueshirts in the 2nd period until very late when the Rangers became re-energized and started to take play to the Kings with the same intensity as in recent games. They continued their efforts in the 3rd period which led to Marian Gaborik scoring the Rangers 4th goal. For Marian, it was another stealth missile that triggered the red light. Gaborik took a lengthy head man pass from Prospal, calmly skated over the blue line, went left, got some separation (as they say in the NFL), settled the puck down before firing it over Erksberg's left hand. The big scoreboard screen showed the replay several times from several angles and all I know is that my jaw remained in the dropped position as I again admired his seemingly effortless skill. (It also was the Rangers' only shot on goal in the 3rd period.) Gaborik has 10 points in 7 games including 6 goals. With 2 minutes left, L.A. pulled Ersberg and Marian tried to get Prospal a hat trick but his pass was deflected at the very last second and Prospal had to be satisfied with a 3 point night. are on your team. Exhibits A and B - Gaborik & Prospal. Side Notes: The Rangers' play was not the only thing out of sync. The Kings scored only 2 goals but there had to be at least 4, if not 5, separate announcements during the last half of the game correcting, adding, substracting, reiterating, the assists on these goals. It was comical. What was not funny was the dismal turnout by the fans. The fans in attendance were quiet and seemed to reflect the out of sync energy of the home team. That happens. What shocked me was the number of empty seats in the arena. 2 seats next to me have been empty for nearly the entire season. For all the complaining by fans about how boring the team was last year, one would think that they would flock to see an early season match-up of two leading NHL teams. Apparently not. There was no excuse of competition like the Jets game on Monday night (note that the Rangers crowd that night was vocal and lively) or a baseball playoff game. Some people told me that it was because the Kings are a Western team -- that may be true but the Kings are one of the top teams in the Western Conference right now. Unless no one is paying attention, the Rangers are leading the league in goals and points. They have legitimate scorers, better skaters, new young players and are certainly more entertaining than any recent team except perhaps the 2005-06 squad. you have a valid excuse not to come to the game, but don't push your luck. At one point this afternoon, there were more than 200 posts on Craigs List by people trying to sell tickets at ridiculous discounts. I didn't even bother to check out StubHub or MSG Scalper Central. I don't know what surprises (or disappoints) me more -- ticketholders deciding en masse not to go or other fans passing up the opportunity to go. Perhaps it is 3 games in 4 nights but that does not stop 45,000+ Yankee fans from trekking up to the Bronx for homestands. Despite being called a sellout, the Garden was perhaps 85% full. I call it embarrassing. Missing a chance to see a game demonstrating why Henrik is a tremendous talent, why Gaborik and Prospal are great 2-way players and why youngsters like Del Zotto are worth watching is a shame. But if the Rangers keep playing like this, a night like this will be the exception. Unfortunately due to the ridiculous cost and the economy, you're gonna have more nights like this. We didn't go and couldn't sell the tix. Club seats went for 65 bucks. I know. You would figure there would be people out there who would want to go at reduce prices. I had a similar problem with my extras. MSG is a corporate crowd. Few people without corporate connections can afford to attend a game. Given the economy, empty seats are to be expected. I think the average fan that goes to a few games a season would pick the Devils, Isles, Bruins, Flyers, and Penguins before a Western team. I know what Tony is saying, that for a discounted fee, why not go to the game? But if I didn't have season tickets, I wouldn't be dying to go to that particular game either knowing there will be more fun matchups ahead.